What Is a Good Tender Roast? The most tender oven roasts are those with plenty of fat marbling and that come from the least-exercised parts of the cow. These best roasts, unfortunately, are usually the most expensive and are not always your healthiest option. If low fat is a high priority, consider braising a leaner cut of beef to make tender and flavorful pot roast. The rib section of the cow produces the most tender, and often the most flavorful, roasts. There are three roasts that come from the ribs, known as the first cut, second cut and rib-eye. The first cut, also known as prime rib, loin end or small end, is the more flavorful of the two. The second cut, which comes from the ribs' large end, is just as tender as the prime rib cut, but it is slightly less flavorful and contains more fat. The rib-eye, which is usually cut into individual steaks, is both flavorful and tender, but slightly less so than the other two cuts. These roasts remain tender after roasting in the oven, even if you slightly overcook them. The short loin, which sits just behind the ribs and in front of the sirloin, also contains flavorful and tender meat. The tenderloin, a particularly tender and flavorful roast, comes from the short loin. Filet mignon steaks come from the tenderloin, but you can leave the roast whole and dry roast it in the oven. Like the roasts from the rib section, tenderloin retains most of its tenderness whether cooked to medium-rare, medium or well-done. Meat that comes from the chuck, or shoulder, portion of the cow contains plenty of well-exercised muscle and connective tissue that make it very tough. When braised over low temperatures for a long period of time, however, the beef becomes extremely tender. 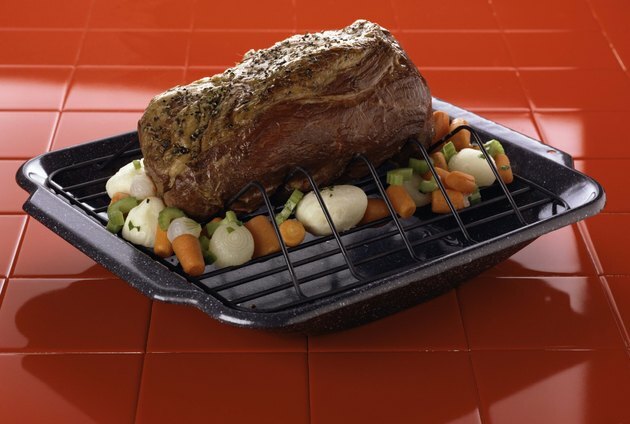 "Cook's Illustrated" ranks two of these roasts among the most flavorful, including the top blade and chuck 7-bone roast. Because these are cooked as pot roasts, much of their natural beef flavor is replaced by the seasonings and liquid that you use to cook them in. But after slow-cooking, both roasts are fork-tender. The U.S. Department of Agriculture defines lean beef as containing less than 10 g of total fat and 4.5 g of saturated fat. Extra-lean beef contains less than 5 g of total fat and 2 g of saturated fat. Both contain less than 95 mg of cholesterol. There are 24 roasts and steaks considered lean and an additional five considered extra lean. The tenderloin, containing 170 calories, 7.1 g of total fat and 2.7 g of saturated fat in one 3 oz. serving, meets the criteria for lean beef, and is the most tender of all the lean and extra-lean cuts. If you are looking for tender pot roasts that won't blow your diet, look to the round roasts. The eye of the round, top round and bottom round roasts all meet the USDA's guidelines for extra-lean beef. You can eke a bit more tenderness out of these roasts by braising them slightly longer than you would a chuck roast. What Cut of Beef Makes the Best Roast Beef? How Many Carbs & Calories Are in Steak?